Ton Toi’s are a set of training exercises that are used by most styles of Kung Fu. They originated in the northwest of China – probably having come from a long ago extinct style, but picked up and used by many current styles. There are three types of Ton Toi’s. The 12 patterns or sets are the most often practiced. They have probably remained the same as they were taken in and used by other styles. Another type is the 10 smashing fists sets used by Tung-lung practitioners. There is another 12 set Ton Toi’s that is used by Ba Gua styles. Ton Toi’s mean “springing kicks”. The sets are primarily used to develop powerful kicks. Combined with hand sets that create a very strong body frame, Ton Toi’s prove to be very useful for all styles. Everything that is taught at our school is designed for sparring – for the martial purpose of defending yourself and others and ultimately controlling your opponent(s). The demanding regimen of punches and kicks, exercises, stances, forms, San Shou and Chin Na are all done to not only learn and develop proper movement, but to also sap the student’s energy before sparring begins at the end of class. With exhausted bodies, the student is forced to rely on technique and proper breathing during sparring instead of trying to out-muscle or out-speed his/her opponent. Speed and strength are certainly important to fighting ability – but good technique is superior and sparring when there is nothing in the tank draws it out of the practitioner. Because sparring is the ultimate expression of our art… spend time thinking about it and studying the higher rank. When sparring, understand that your fellow kung fu brothers and sisters are not going to kill or injure you like someone outside of the school might in a street fight or if they broke into your house. With that in mind, don’t be afraid to try new techniques with them. Learn from both your victories and failures on the mat. Study your forms – what are the purposes of each movement? Pay attention in class when Sifu is teaching techniques. Practice and drill down on movements you are interested in developing during San Shou and Chin Na before implementing them in sparring. Don’t give up if they didn’t work perfectly the first few times. If the movements survived hundreds of years of use in actual combat, there is certainly something to them. Sparring is the closest thing to real-world fighting we have – without beating each other to a pulp. It’s purpose is to prepare you for anyone outside of the school… both untrained and trained fighters alike. You MUST have the attitude in class that you are training for a potential life or death situation. Imagine invisible opponents in front of you during kicks, single step movements, forms, etc. Do not give up during sparring or cower should you be bested in an exchange. Roll out or do our best to escape or counter the situation before being forced to bow to your opponent to stop. Having purpose and intensity in your training at the school will make you a very formidable opponent outside of it. Yes, incalculable benefits are derived from this training beyond those of fighting. Much of the valuable philosophy of our martial arts can not be taught and understood with words, but only learned through the resolve of consistent effort and the skills that result from it. Fantastic physical fitness is a given after many years of consistent training. Confidence and character are earned – not given simply by putting on the uniform. All of these are the result of training with sparring in mind. An article featuring Sifu Robert and a self-defense class he’s running in Laguna Woods was recently on the front page of the Laguna Woods Globe (Thursday, March 13, 2014). Laguna Woods ~ Master Charles Robert darts nimbly among the lines of students, like a dancer choreographing a waltz. Casting his eyes on their stretch kicks, he fine-tunes their form. “Relax your shoulders,” he instructs one woman. “Don’t bend your front knee.” he cautions another. Later, Robert pairs up participants to practice the ancient escape technique of Chin-na. 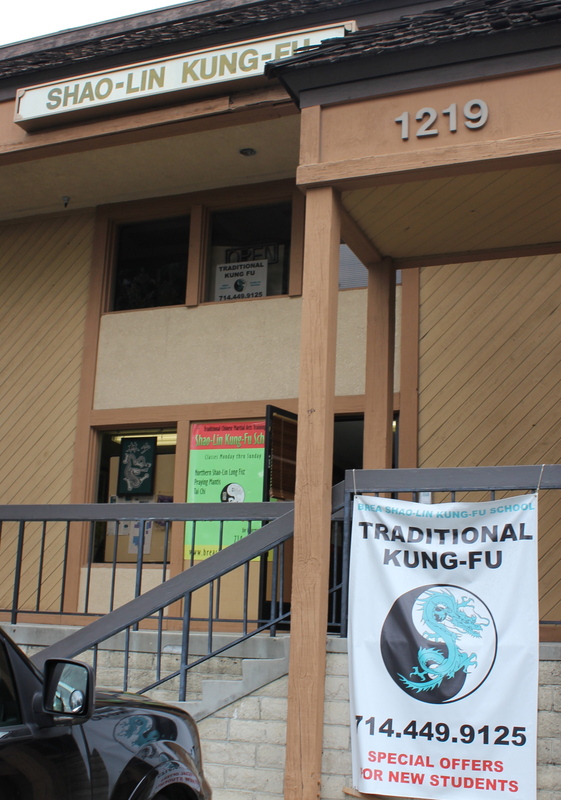 About a dozen had turned our to preview the new Kung Fu Self-Defense Class at Clubhouse Six. The eight-week session begins at 10 a.m. today. Sponsored by the Recreation Division, the hourlong class teaches participants the basics of Shaolin Kung Fu. Students will learn stretches, kicks and forms as well as self defense strategies such as hand strikes, escape techniques and leverage over brute force. Classes are designed to flow at the pace and skill level of each student, building upon what they’ve learned. By the end of the session, students will have increased their balance, strength, and endurance substantially, Robert said. For many residents, this class is their first foray into the martial arts. Originated 1,500 years ago in the Shaolin Temple in Henan, Shaolin is considered the premier martial style in China, and is practiced worldwide. Based on the Buddhist philosophy of nonviolence, the intention is not to kill your opponent, but to stop them from harming you. Before and after sparring, opponents pay respect to on another by placing their left hand over their right fist, symbolizing knowledge over aggression. The’s followed by mutual bows. Robert began his Kung Fu training in 1979 and has won gold, silver and bronze medals at the International Praying Mantis Tournament in Yantai, China. Classes will be held in the Clubhouse Six Main Lounge from 10-11 a.m. Thursdays beginning today. For information or to register call 597-4273 or visit the Recreation Division Office in the Community Center. Along with the first few stances, kicks, single step movements and San Shou, new students begin to learn escape techniques as their introduction to Chin Na. As a beginner, these movements are essential to be able to break away from someone who is trying to control you with a strong grab. Escaping a bad situation is most often the right decision for someone who has not yet learned how to effectively defend him or herself. The escape techniques are excellent for making that happen and students should not discount the importance of perfecting those movements. What new students don’t realize is how these “beginner” escape techniques become the first piece of some advanced techniques they’ll learn in the future. They usually see higher rank using sticky hands to attack their partner’s joints and hear the smack of their partner wincing in pain. They think “Why escape, if I can simply use sticky hands to lock them in and inflict as much damage as necessary?” They want to skip past learning escape techniques and onto things that make someone hurt immediately. It’s understandable to think that, but there is a reason for everything in our training. Kung fu training is cumulative. Much like with learning math, kung fu skills build on each other. It’s quite hard to do trigonometry without a solid base of geometry and hard to do geometry without basic arithmetic. Without strong foundations, more complicated techniques simply won’t work. By building a solid foundation of escape techniques, you will eventually learn how to successfully follow the escape with a technique that often reattaches to the opponent in a more advantageous position for you. This reattachment is usually followed by a vicious joint attack. Additionally, many escape techniques put the opponent in an ideal position for a pretty forceful strike. Like the rest of our kung fu, Chin Na is supposed to flow from one technique to the next. So learn the escape techniques well and their will be more to follow in time. As you train, new forms are taught to advance the number of techniques you know and develop your physical abilities. These forms are an essential part of the art and each movement contains many techniques for fighting. As mentioned in a prior post, it is not enough to know the form. You must really know the form. So much so that there must be no chance to get it wrong. That is when you truly “own” it and are able to utilize the techniques inherent in it. This may take hundreds – even thousands – of repetitions and many evolutions of the form for it to become ingrained in your body. Besides attending class every day, a simple way to develop mastery of your form is to practice your newest form(s) at least once or twice every day. As there is usually a good space of time between learning new forms, you will have the opportunity to practice this form (or perhaps the last few forms) at least dozens of times. Maybe it’s when you wake up, before you leave for work/school, after dinner or sometime before bed. Practice it slowly – on count – at first and then do it again at full speed. Make a habit of it and your forms and your martial skill will improve faster and you will test for your next rank with much more confidence. Don’t forget – this does not take the place of attending class regularly! Take as many classes as you can to maximize your progress in the art!